Another quick image with the new Artemis 285 ccd camera. The field of view is most impressive but the collimation of the scope has effected the ultimate resolution. As you can see, the star shapes are poor, especially in the bottom right. I fancy the mirrors are fairly well lined up, but the light cone is not properly aligned with the mechanical axis of the focuser drawtube. You can see in this close up image of the region with my SC3 that a much high quality of resolution is possible. Mind you, the field of view makes up for it. I was going to make a colour image, but dropped my red filter in the dark, and can't find it now! 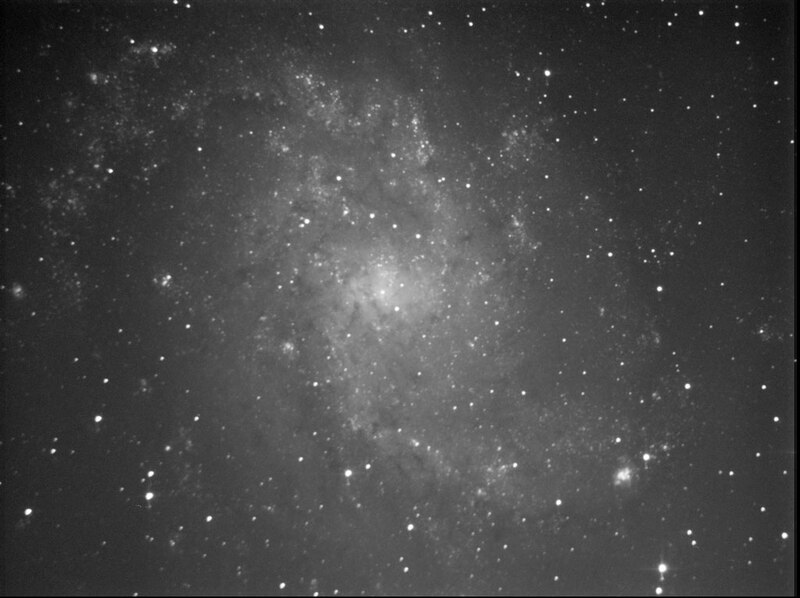 This image still only shows a part of the M33 galaxy - but at least with this field of view it looks like a galaxy! Captured in Artemis capture, stacked in registax, curves and slight reduction in photoshop.